This project was created on 07/04/2018 and last updated 9 months ago. Long lasting power is the greatest barrier to large scale use of information gathering sensor networks. Powering these devices from batteries drastically increases their installation and maintenance costs. Solution lies in giving them ability to scavenge energy already present in the environment. Devices would be able to operate 10 to 20 years without any maintenance and it would drastically increase shelf life since they won&apos;t require pre-charged batteries. 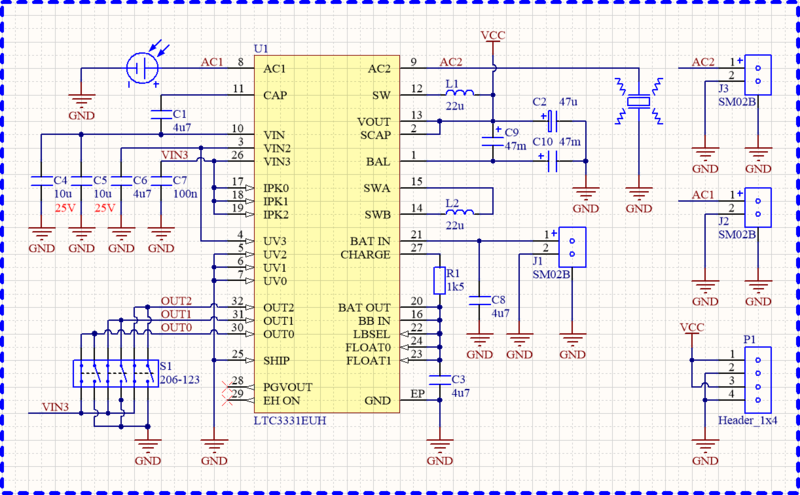 The goal of this project is to make universal bed around which custom wireless sensing devices can be built. Solution will be highly user customizable and easy for installation, saving on biggest cost in supply chain - human labor. PTPM energy scavenger is designed as platform that can be easily adapted to vast range of environmental sensing applications. Heart of the platform is energy scavenging module that can harvest energy from photovoltaic, thermoelectric, piezoelectric and magnetic induction sources. PTPM platform is made out of Energy scavenging module, low power microcontroller module, ISM 2.4 GHz RX/TX module, humidity and temperature sensor, piezoelectric element, photovoltaic panel and universal enclosure. Main advantage of this platform is that each part is easily swappable and upgradable depending on the user application and requirements. PTPM platform can be used in agriculture, weather forecast and industry applications. Monitoring for irregularities in industrial machine behavior may predict malfunctions before they happen. This would allow to schedule preventive maintenance and better tracking of MTTF and MTBF times. Benefit of such monitoring is that machines won&apos;t malfunction during production and cause delays in delivery and financial damage for factory and customer. This makes end goods cheaper and faster to produce. Advantage of this platform compared to similar solutions is that it can power itself from vibrations generated by machine. Since battery is optional sensor can operate longer and can be mounted in hard to reach places since it doesn&apos;t require as frequent maintenance as battery operated devices. Magnets on the bottom of enclosure allow for fast and easy mounting on metal machine body and magnets on cover panel allow for easy access to electronics inside which reduces MTTR time. Log 1: Measuring energy output of photovoltaic and piezoelectric energy sources in different environment of application. Log 2: Concept and electrical detail of energy scavenging module. Log 3: Assembly details about energy scavenging module. Log 4: PTPM platform in environmental monitoring applications. Log 5: PTPM platform in industry monitoring applications. Image below shows Energy scavenger module in 3D printed enclosure. There is also ATmega328P arduino compatible board optimized for low power operation(only basic components, running on internal oscillator), ISM 2.4 GHz RX/TX module(NRF24l01+) and humidity and temperature sensor(DHT11). Energy is harvested by piezoelectric element and photovoltaic panel on top of the enclosure. There is also hole for external clip-on antenna but for running first tests long range capability is not needed. Device in this configuration is located in backyard and is monitoring temperature and humidity and sending it to nearby node(located in house), periodically every 60 minutes. Data is logged and then plotted. Since there is not much data to transmit and distance from mode is not more than 50 meters low data rates of 250kbps and transmitter output power of -18dBm are more than enough here. With this specs device consumes around 20uA in idle and around 7mA when transmitting. As it can be seen from from measurements conducted on photovoltaic panel in previous project log, panel can provide more than enough power for 24/7 operation. Video below shows process of PCB assembly. Since there is small number of components and most of them are TH, I decided to save on stencil and apply solder paste by hand. This approach is not optimal for small pitch packages because it require additional rework to remove formed short circuit bridges. In the end, because there is only one small pitch component it will be more time efficient than soldering components one by one. Assembly drawing makes placing components easy, fast and decreases chance of placing component in wrong position and ruing your day. Enclosure is 80x100mm so that it accommodates photovoltaic panel of the same size. It can be mounted using magnets(fast and less labor intensive) or screws(more secure option). Cover lid with photovoltaic panel is held with magnets. Inside, there is place for custom electronics, sensors and additional external antenna to increase signal range. Since enclosure is 3D printed and used just as proof of concept it does not have proper IP protection against environmental effects, therefore alternative protection of electronics is needed. After assembly module is conformally coated to protect solder joints from corrosion. Corrosion may occur when module exposed to moisture and humidity. This is necessary since module will be enclosed in 3D printed prototype enclosure which can&apos;t properly protect against environmental effects. Energy harvesting input(AC1, AC2): Internally connected to low voltage drop full bridge rectifier and step-up/down switching converters. Energy storage - optional(BAT) and on-board (C10, C9): External battery can be used for high power consumption applications or if not needed it can be excluded to save on cost and space. Output voltage selection(S1): SPDT switch for adjusting output voltage from 1.8V to 5V. Output power supply(P1): Pin header with two Vout and two Gnd pins. Resistor R1 is used to adjust battery charging current. Equation for calculating charging current is: Icharge = 1.6 / (R1+60). Charging current should be in relation to average available harvestable energy in surrounding environment. Following measurements will evaluate effectiveness of photovoltaic panel(100x80mm) and piezoelectric element(PN:LDT2-028K/L) in energy harvesting application. Photovoltaic panel is tested indoor at illuminance of about 150 lux and outside in full daylight(~10000 lux). Test setup includes photovoltaic panel, DMM and resistor decade box. Conclusion: Indoor, maximum power output(red marked area) achieved with input 2.2V@440uA while outdoor with input 3.8V@13.8mA. Average current draw of the device should be around those values. Piezoelectic element is attached to speaker membrane and driven with 50Hz sine wave to emulate vibrations produced by operating machinery. Small mass(magnets) are added to tip to see its effect on output voltage. Magnets used are: 2x1mm - 2pcs(0.04g), 3x1mm - 2pcs(0.09g), 5x1mm - 2pcs(0.26g). Test setup includes piezoelectic element, speaker, audio amplifier and function generator. Example of magnet used for adding mass to the tip. Resonant frequency with no tip mass, 0.04 grams, 0.09 grams and 0.26 grams. Conclusion: Adding bigger mass to the tip dampens the element(lowers the resonant frequency). For maximum power output tip mass coresponding the resonant frequency of the vibration source should be chosen. You are about to report the project "PTPM Energy Scavenger", please tell us the reason.